Back in December I was at a cozy farm in New Hampshire, sheltering from the snow with old family friends and talking about the coming summer. Bridget, who I have known since childhood, and Ben, who I met then but instantly took to, were planning their marriage in August. They had seen my work and asked me to make something for them, for the wedding: an object to enter their lives on that day that would be symbolic of the years and lives that had funneled them together, and the corresponding array of actions and story-lines that will spread forward from them in time. Their awareness of and respect for the presence of a handmade object that can endure for even centuries when cared for means much to me. Also their requests for symbolic use of material in terms of provenance and association were exactly the creative material I like to work with. 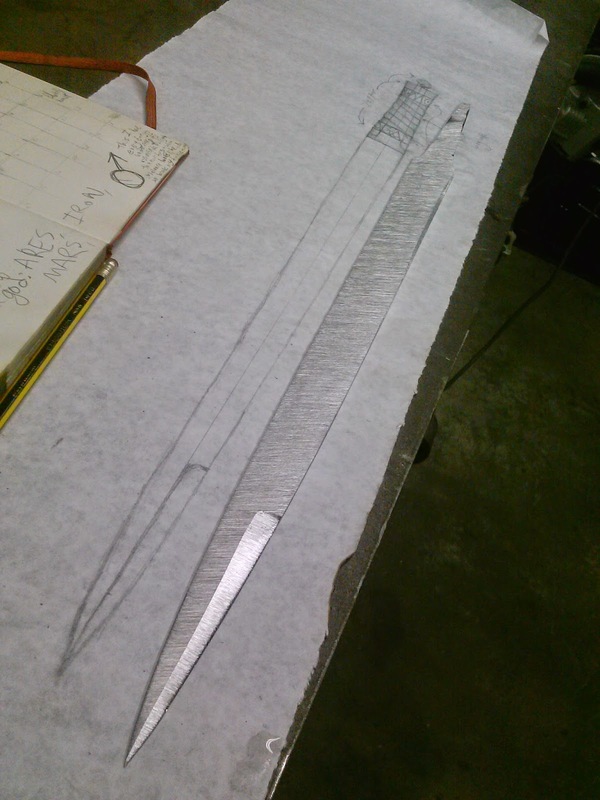 With these inspirations in mind, I drew up a concept for a skean, an Irish fighting knife native to the 15th and 16th centuries, in honor of Bridget (Mohan) and Ben (Flanagan)'s shared heritage. I included the materials Ben & Bridget had requested: oak (the sigil of the Flanagan family) and something native to New Hampshire (where Bridget grew up). These I answered with Irish bog oak, which spent most of its 1000 years as wood submerged in a peat bog being slowly but fully tanned black, and antler from a moose that lived and died in the White Mountains of New Hampshire. 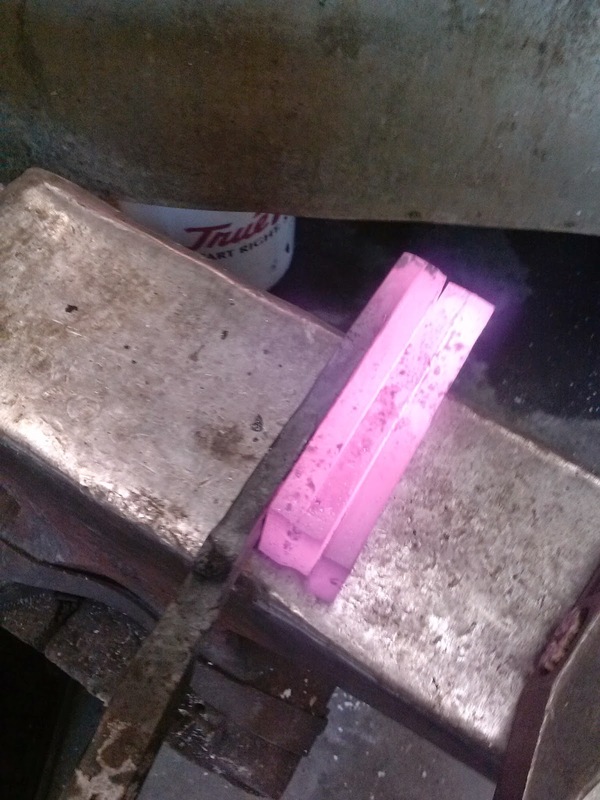 I also began to prepare a special steel. I started with alternating layers of 1095 and 15n20, and folded these roughly to 48 layers. Then I rotated the billet 90 degrees and folded again to 48 layers. This was after asking Owen Bush how he goes about making pattern-welded steel that is intended to imitate the ethereal and indecipherable patterns of wootz crucible steel. 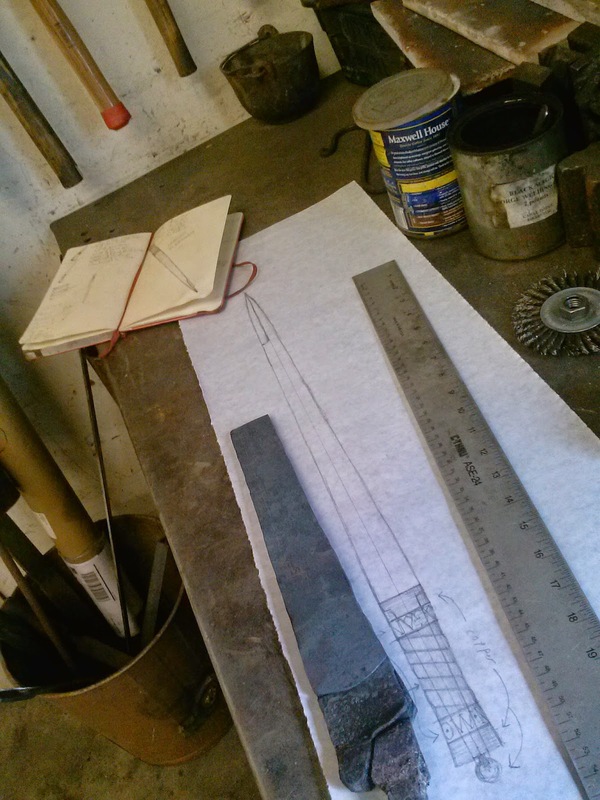 I really did not succeed in doing what he does, but continued to follow his directions to make something new to me: this billet folded in two planes was then "laddered", which means many grooves cut into each side for pattern disruption and then forged flat again. The surface of the material is then smooth but the currents within it are roiling and turbulent, like ink dripped into a glass of clear water. Some semblance of this is visible in the fire-scale on the red-hot billet pictured above. The next part is the less classically poetic but equally as enjoyable and beautiful to one who loves this process as much as I do. It was careful, slow, shaping by abrasion: filing and grinding is like the action of glaciers over mountains, slowly scraping built up accumulations down to the white bedrock. It is also like chiseling a statue from a block of stone: a million variations on a form are dormant in this block that can no longer be manipulated plastically, and you will choose one (or it will choose itself). From there on, the blade was a challenging but ultimately triumphant series of issues. 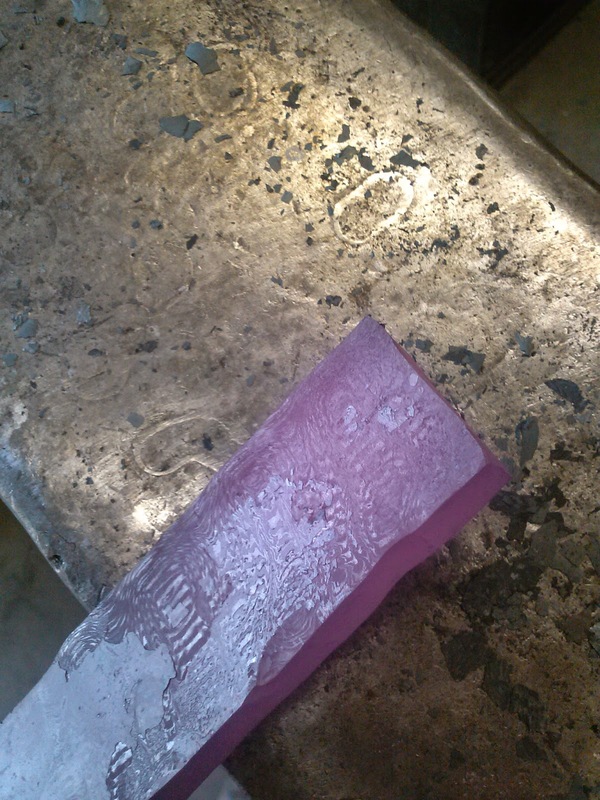 It warped drastically in hardening, but after tempering it, I was able to grind it back to straight and true. Then I carved and fitted the handle of bog-oak, moose antler, and copper. It was ready to be brought to final finish, etched to reveal the pattern, and assembled.